Hot Pics! Hot Pics! Hot Pics! A Victory for the Sabbath in Tel Aviv? I have to admit that the site of supermarkets in Tel Aviv that are open 7 days a week used to break my heart. We have merited to live in the era where the Nation of Israel is returning to the land of Israel. The land is giving its fruit, the army is victorious, and Hebrew, as a spoken language has been revived. Torah is being widely learned, perhaps on an unprecedented scale. In the midst of all this, to see stores that proudly proclaim that they desecrate the Sabbath is like hearing somebody singing off-key in the middle of our song of redemption. The Tel Aviv-Jaffa Municipality must enforce municipal bylaws which prohibit the operation of businesses on the Jewish Sabbath (Friday sunset through Saturday sunset), the Supreme Court ruled on Tuesday. The court ruled in favor of an appeal filed by food retailers in the city against a decision by Tel Aviv Administrative Court Judge Esther Covo from February 2012, who refused to order the closing of businesses on the Jewish Sabbath. Supreme Court Judge Miriam Naor, Elyakim Rubinstein, and President Asher Grunis ruled that the Tel Aviv-Jaffa Municipality must enforce municipal bylaws in order to uphold the law. "With its present conduct, the municipality in practice allows the ongoing violation of this law. There is also concern that it is convenient for the municipality not to uphold the law in view of its profits from the levying of fines." Judge Rubinstein said that he hoped that "an enforcement solution would be found to uphold the law, honor the Sabbath, and the residents of Tel Aviv." The Tel Aviv-Jaffa Municipality said in response, "Tel Aviv-Jaffa will continue to be a free city. We will study the ruling and find a solution to balance the Sabbath day of rest and the freedom that the city allows, as it has done until now." One shouldn't assume that Tuesday's Supreme Court verdict will totally halt Sabbath commercial activity in the "city that never rests." But if enforced properly, using every tool in the city's arsenal, it could reduce the extent of commerce on Shabbat, thereby leveling the playing field between retail chain tycoons and the owners of mom-and-pop stores who can't or don't want to stay open 24/7. As the Supreme Court's Deputy President Justice Miriam Naor said, this is not an attempt to coerce religion. Rather, there is an existing by-law that is not being properly or meaningfully enforced, thereby defeating its purpose. Those who travel the world know that larger metropolises than Tel Aviv preserve the character of their weekly day of rest. It affords city residents a respite from the noise and bustle of daily life. The verdict brings justice to the appellants and their friends, small grocery owners, who wish to rest a bit from the Six days of Creation. For the sake of profits, large retail chains, with their vast money and resources, employ workers on the Sabbath. These workers are usually from the lower socioeconomic strata and toil for poverty wages. This phenomenon has been spreading throughout the first Hebrew city and gives small shop owners almost no chance of surviving. Not to mention their desire to spend a little time with their families and not be slaves to their work. 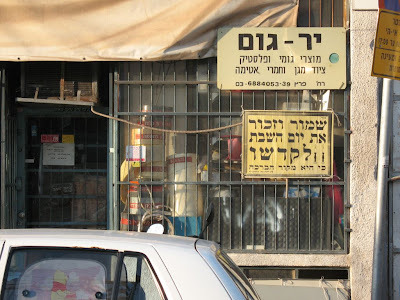 As Justice Elyakim Rubinstein said, the ludicrous fine imposed today on store owners who open on Shabbat makes a mockery of the law, turning it into an officially sanctioned lie. It deters no one and therefore foils the law's intent. Some people are very upset about this ruling. After all, it interferes with their freedom. What will they do if all of a sudden they discover on the Sabbath that there is no milk in the refrigerator? The solution is of course to do what the Jewish People have done for centuries: prepare for the Sabbath! Check your refrigerator on Friday morning and see what is missing. Make a list of what to buy and then head off to your local grocery store/supermarket. It's really simple: even secular leftists are capable of doing this! I know, mistakes are made. Sometimes we just don't notice on Friday morning that milk is missing. In that case, knock on your neighbor's door, inquire about his health and the health of his parents and/or children, and then politely ask him to borrow some milk. You do not need a doctorate in international relations in order to do this! While we are on the subject, check this out. It is an interview with the grocery store owner who initiated the court case against the Tel Aviv Municipality. He claims that the Hareidi and religious parties did not help them in their struggle. He also has some other very interesting claims (the interview is in Hebrew). As you can see, along with some typical-far-out graffiti and something written in Arabic, someone wrote the "Shema" (Hear O Israel, the LORD is our God, the LORD is one) on the wall of this building. I wonder if the person who wrote that realizes that the Torah is anti graffiti . You are not allowed to damage someone else's property! This is of course assuming that the owner of the building did not write that on the wall. Recently I finished reading the book Ratziti Lihyot Tov (I Wanted To Be Good). The book is a collection of stories about Chanan Porat z"l, written by Oded Mizrachi and published by Rosh Yehudi. Chanan Porat was a well known figure here in Israel. He was one of the founders and leaders of Gush Emunim, and a member of the Knesset for 11 years. This book reveals to the reader other facets of Chanan Porat's amazing life that are not so well known. Chana was not just a politician. He was a Torah Scholar, a genius. The book quotes Rav Avraham Shapira saying that if Chanan would have kept studying full time instead of getting involved with public affairs, Chanan would have become Merkaz HaRav's Rosh Yeshiva instead of him. Chanan was involved with Chessed, acts of loving-kindness, on a very large scale. Chanan Porat was also physically strong. He was one of the paratroopers who liberated Jerusalem's Old City in 1967. He was seriously wounded in the 1973 Yom Kippur War. Chanan had 11 children, among them one who was adopted. I highly recommend this book. It is fantastic, right up there with A Tzaddik in Our Time by Simchah Raz. I hope that the book will be translated into as many languages as possible in order that all those Jews that still have not learned Hebrew can benefit from reading about this stellar personality. Here is an interview with Rabbi Porat several months before he passed away. He suffered from a malignant tumor in his brain which at the time of the interview partially paralyzed him and interfered with his speech. The tumor eventually caused his death. Four years after shooting at Tel Aviv youth center where 2 were killed and 11 wounded, police reveal that target of shooting was LGBT community leader who was believed by suspect to have sexually abused his 15-year-old relative. A 19-year-old man put on a mask and ran into the Bar Noar LGBT center and began firing in all directions, killing two and wounding 11, in an attempt to avenge the sexual abuse of his 15-year-old relative by a grown man he expected to be at the center, police cleared for publication on Monday. Police also cleared for publication that the whole investigation was cracked after a witness came forward, a man who was a member of the LGBT community and helped plot the shooting. The witness is not the same member of the community who was arrested last week for the abuse of the minor, and whose identity can still not be revealed. Read the rest over a jpost.com. I personally was surprised that it took the police so long to solve this crime (if indeed, it has really been solved). I am pretty sure that the area where the murders were committed is just full of surveillance cameras. For four years, leftists blamed the religious sector, and especially hareidim, for the 2009 double murder in Tel Aviv's Barnoar club, which caters to homosexual youths. A gunman opened fire on youths at the club, killing a young man and a young woman, and leaving others crippled. Leftists are in no hurry to apologize for laying the blame at then-Interior Minister Eli Yishai's doorstep, and for assuming that the perpetrators were religious people who hate homosexuals. Meretz head Zehava Galon said that she was “shocked” by allegations that the attack was not a a hate crime. She insisted that the murderers shot club-goers because of their sexual tendencies. She ignored the false accusations over the last four years. Mr. Horwitz, it is so much easier to speak the truth than to twist the meaning of words in such a crooked fashion! The murderer did not hate homosexuals. He hated the man who sexually abused his relative! Rabbi Shai Peron is not Alone! “I cannot explain how proud it made me feel, competing to the most famous Jewish song in front of Germans, Russians, and people all over the world,” she told the women gathered at the Westminster Hotel in Livingston on May 29 for the eighth annual Mikvah Chana fund-raising event. In pants and long skirts, v-necks and high-cut dresses, in pumps and flats, representing the spectrum of Jewish denominational life in the area, over 600 women had come to support the Livingston mikva, or ritual bath. Representatives of the facility said it would take several weeks for them to determine how much money was raised. The event was cochaired by Dara Orbach, the great-granddaughter of Annette (Chana) Felsen, after whom the ritual bath is named, and Toba Grossbaum. Mikvah Chana, in a house built on North Livingston Avenue, would have stunned Jewish grandmothers of yore. It offers fluffy towels and robes, a soothing fountain, a spiral staircase, a dome-shaped ceiling, and even selections of kosher chocolates on the way out. "Mikvahs in the past were in basements of synagogues, and dingy," said Rabbi Zalman Grossbaum of Chabad of Livingston. "Today's mikvahs have really gone to a whole new level. They are presented as top of the line, prettier than people's homes -- that's saying a lot for a Livingston mikvah -- and presented with dignity and importance." Indeed, many of the new mikvahs have unashamedly used their spa-like features for publicity as their numbers have risen from 200 nationally in the 1960s to more than 400 now, according to the Web site mikvah.org. Congratualtions to Aly for her continued involvement in the community. What in the world was so funny? Following the disclosure of separate days for Jewish and Arab schools at the Superland amusement park, Justice Minister Tzipi Livni announced, Thursday, the opening of a hotline, run by the Justice Ministry's legal-aid department, to deal with inquiries about discrimination or racism. Livni's office said the hotline will provide preliminary information about legal issues related to the inquiries and guidance to relevant authorities, as needed. Ministry Director-General Guy Rotkopf said, "The Justice Ministry and its various departments will continue uncompromising efforts to eradicate the phenomena of racism and discrimination, which harm all of Israeli society." This is a long clip, over 40 minutes long. I surprised myself by investing the time to listen to him. What can I say? The guy is a thinker with interesting and revolutionary ideas.